Enclosed crawlspaces can be a magnet for moisture, mold and rot. Traditionally, the most common method of dealing with moisture in crawlspaces — and the one longest endorsed by codes — has been to ventilate them. But does ventilation really provide the drying and moisture control desired? Are there other more effective methods? And what about the energy impacts of venting the space directly below the main living space in a house? If improperly constructed, the crawlspace can affect the comfort inside the house, as well as its energy consumption. If the floor structure above the crawlspace is uninsulated, heating and cooling losses will result. Gaps in the flooring will also admit moisture from the crawlspace below, which will affect indoor air quality. Careful design and construction to mitigate the entrance of moisture and condition the space is your best line of defense. Enclosed crawlspaces are usually contained by a solid concrete or masonry foundation wall that extends down to footings just below the frost line. Porous materials such as wood and insulation can absorb a lot of water. And when these materials get wet, they tend to stay wet. The water in these materials can keep the humidity at the surface high enough to support fungus and mildew; 80 percent relative humidity (rh) is a commonly used threshold. There is no simple relationship between the moisture content of the wood and the surface humidity that encourages fungal growth, but a 20 percent softwood moisture content is generally cited as the threshold above which one should be concerned. 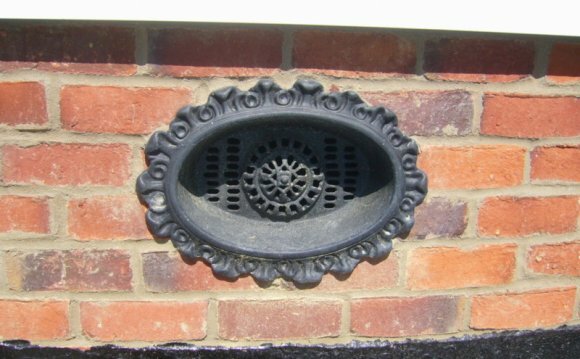 Create positive surface drainage around the house. Either provide working gutters and downspouts, or install generous eave overhangs coupled with positive surface drainage. If the crawlspace is warm and humid, fungus will grow on any surface that is either porous or slightly dirty. Even in a relatively dry crawlspace, a persistent leak can keep an isolated area, such as a section of the band joist, wet enough to grow fungus and attract pests. A less likely possibility is that standing water will foster the growth of deadly microorganisms such as Legionella bacteria, which causes Legionnaire's disease. Problems occur when moving air picks up the microorganisms and spreads them through the occupied spaces. The chances are fairly remote that this will occur, but it did happen in 1976 at a convention center in Philadelphia, where Legionella grew in the ductwork and the bacteria were delivered through the moving air stream. Choosing not to ventilate a crawlspace with outdoor air has two major advantages: energy savings and control and prevention of moisture problems. Compared with the minimum ventilation allowed by code, the energy savings from not venting may be small in a well-built and well-sealed home. Compared with the leakiest worst case scenario, however, closing up a crawlspace can make quite a difference. Thermostatically controlled automatic louvers and manually operated louvers are available that can close off the vents when the temperature drops below freezing. Although louvers allow ventilation without incurring large energy losses, it is unlikely that such devices can be kept in good working order for the life of the home, and indeed, there are many reports of failures. If the devices fail in the open position, they are useless; if they fail in the closed position, the owner will not have ventilation when it is needed. Unless a relatively foolproof device is available, or high levels of maintenance are expected, build an unvented crawlspace that is mechanically conditioned instead. If properly designed and constructed, an unvented conditioned crawlspace can thwart mold, mildew and pest problems; improve the house's energy performance; and prevent rot in the structure. A conditioned crawlspace is also a good place to locate mechanical equipment and ductwork since the negative effects on the HVAC system's efficiency due to outdoor temperature swings will be eliminated. Avoiding moisture in the crawlspace is the most critical aspect to address before sealing the space. We strongly advise installing a plastic membrane or installing a concrete slab with a 4- to 6-inch gravel and polyethylene membrane underlay. A membrane on the floor is one of the most effective methods for controlling moisture. The membrane can be 6-mil poly, but heavier fiberglass-reinforced poly will better resist traffic and damage from stored materials. The membrane will serve as both a vapor retarder and air barrier and, if it is sealed at the edges, will also control soil gases like radon. A concrete slab will function as a membrane unless the ground under the slab is very wet. If it is, you may have to remove the water with drains or pumps. A membrane under the slab coupled with a layer of gravel or stone to break capillary action will inhibit water from rising to the slab, but won't help prevent water from rising within the foundation walls. Install a full plastic membrane or a concrete slab on every crawlspace floor. This is the number one preventive measure that in most cases is much more useful than ventilation. Do not build so that the seasonal high water table or floods rise above the footings. This is a condition that requires a completely open crawlspace or a building on pilings. If the footings stand in water or get wet seasonally, provide a capillary break between the footers and the foundation walls. Carefully install and test water and waste piping, making sure that there are no leaks at the joints or punctures. Take effective measures to prevent ice dams, including adding sufficient attic insulation. Provide positive weeps at masonry veneers. Do not locate vent fan exhausts, dryer exhausts or condensate drains in the crawlspace. The next step in creating a conditioned crawlspace is to properly seal it. By far the most important reason for sealing a crawlspace is to avoid condensation in humid climates. This condition can arise in cold climates, but it may occur in almost any humid climate if the temperature of the crawlspace floor falls below the dewpoint of the outside air. During the winter, the ground under the home gets cold. A sudden warming spell in the spring will send in warm, humid air, which will condense on the cold ground. Plug cracks in foundation walls, as well as cracks and penetrations in the floor structure above the crawlspace, with sealant. Very carefully seal the points where the house structure meets the foundation wall. Cover old vent openings in the foundation wall with plywood or masonry and seal. Next, insulate the walls instead of the floor above. You can determine the amount of insulation needed by consulting paragraph N 1102.1.7 in the International Residential Code. Most areas of the country require between R-5 and R-20. When insulating, provide access strips to allow inspection of the wall plate for termites and wetness. Rigid insulation rated for crawlspace exposure tightly adhered to the foundation is better than insulation that creates hidden void spaces where mildew can grow.